While Rebekah has been digging to her heart’s content in the Grid 16 step trench, I have been mostly working in Grid 20, which we affectionately refer to as the “Snake Tower.” As you can imagine, this name has a purpose. It’s not that it looks like a snake or has some meaningful historical origin, but in recent times a snake or two was spotted when it was being surveyed for excavation, and as with nicknames, it caught on. Here is a view from down the rampart slope, looking up. So how does this grid and it’s architecture factor into the history of Ashkelon? The majority of what you see in the photo is Islamic era construction, some of it possibly Crusader. 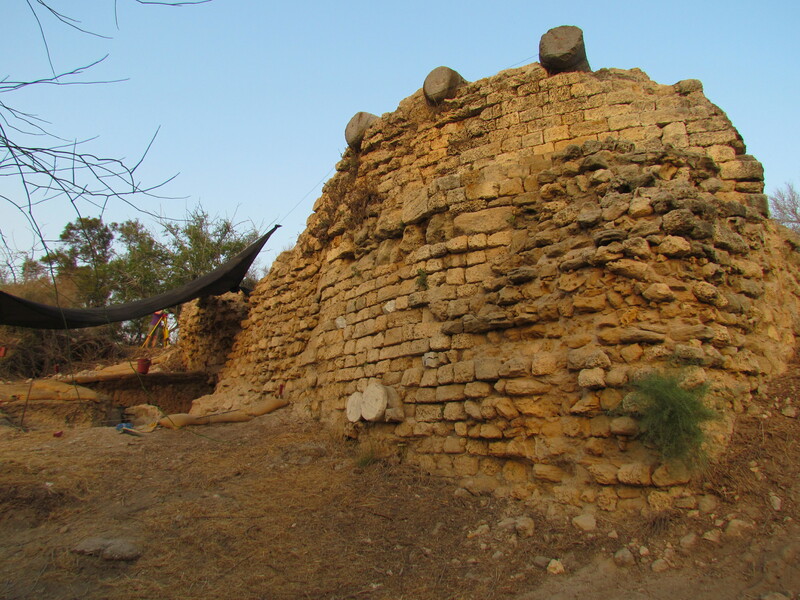 This is much later than most of the history we have focused on in this blog related to Ashkelon (apart from historical overviews). The grids we were in last year were from much earlier time periods (me in Grid 51 Persian layers, Rebekah in Grid 38 Philistine layers). 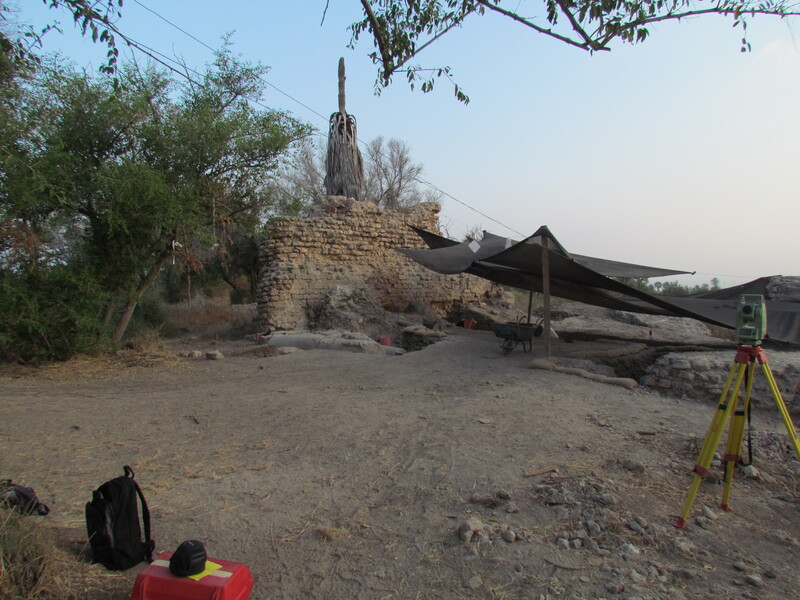 Grid 20, our “Snake Tower” location, was initiated this year to investigate the latter years of Ashkelon’s fortifications and how they were modified over time during the different Islamic periods (11-12th century A.D.) and the Crusader periods following. Photo of earlier construction at the base of the tower, explained below. It is interesting in the photo above, that we actually do tie back to earlier times. This does not quite not make it back to the Persian period, but the current thought by experts is that you do see some Hellenistic (Greek) wall construction in this photo. In the center, notice the larger blocks with white lime mortar, extending up to where the current ground level is at the edge of the trench. The block composition and mortar style is similar to structures found some years ago in Grid 47, where the odeon (small Roman theater) was built on top of previous Hellenistic construction. Something interesting to think about as we expose this wall and lower layers is how the original digging for the foundations for the larger and taller Islamic wall would have exposed and reused foundational elements of the Hellenistic walls. This would have happened some 1,000 years after the Greeks were fortifying the site. 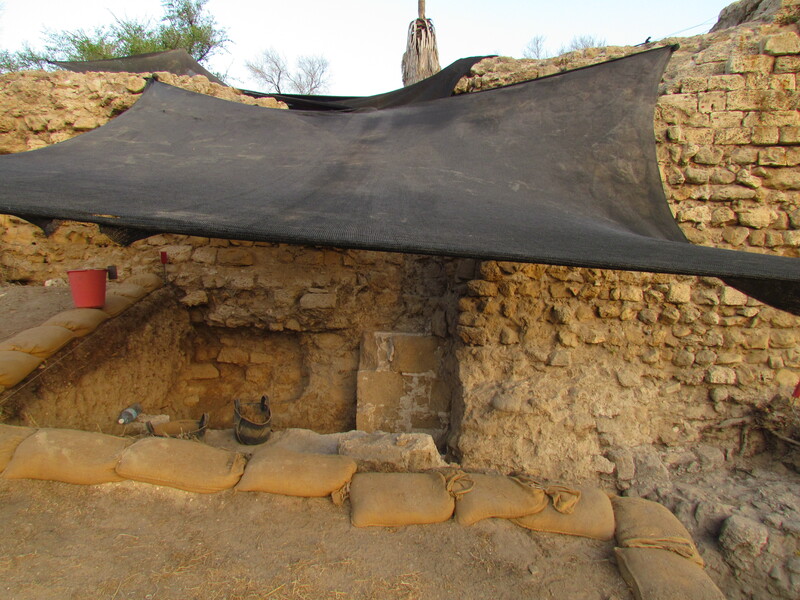 As we are digging the site today, it is some 1,000 years after the Muslims and Crusaders were occupying the site. I wonder if, when the Muslims or Crusaders were digging their foundations, they took a moment to ponder whose wall they were coming down on and thought about it in any way as we do today, asking the questions of “who built this,” and how or why. Of course, they may have been building as fast as possible to prevent the next invasion. If in that mode, it does not leave much time for historical reflections. This is another view of the site, from the top of the ramparts, complete with excavation shades. Below is a photo of a wall foundation. What is interesting here, as with the front of the Snake Tower, is the reuse of ancient columns in medieval architecture. In the Snake Tower itself, the use of columns looks aesthetic, but would serve as a strengthening component when used at 90 degree angles to the layout of the tower. 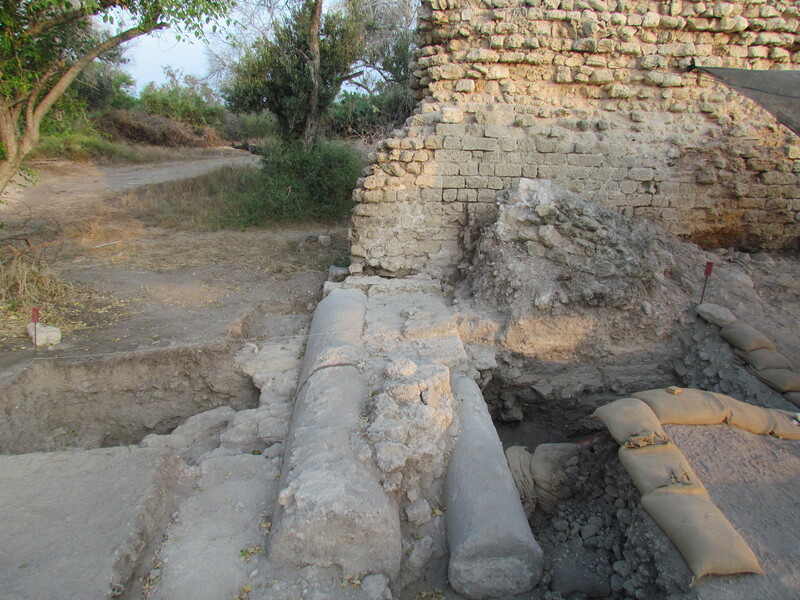 However, in the photo below, you can see where columns were used in parallel orientation with a wall foundation, which would actually make the wall less stable, particularity when the mortar begins to chip away. The wall just behind this, still standing, also has some column use parallel with the wall. Admittedly, it has been standing for over 1,000 years…so I suppose we owe the design engineers some credit. Why do you want this view? In the parting shot for this post, it is apparent why this location was a perfect spot for ancient occupation. Ashkelon’s ancient ring of sand dunes, with the gaps filled to create the earthen ramparts which still exist and shape the site today, provided an excellent vantage point over the surrounding land. 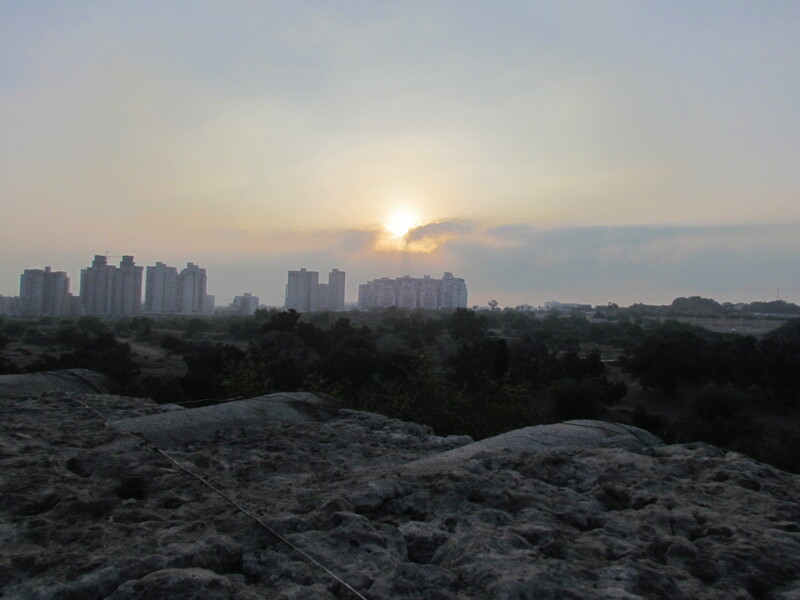 Philistine or Greek, Islamic Fatimid or Crusader, ancient defenses were all about vantage point. All directions were visible from Ashkelon’s ramparts, but north and east could particularly be viewed for some distance. Take away the modern buildings and introduce ancient cropland and barren patches, and you have the view which would have existed for centuries–just change the names of the occupants or the invaders. But, even though their names changed, through all the transitions, the city name always seemed to stick. Much like the “Snake Tower” for Grid 20.